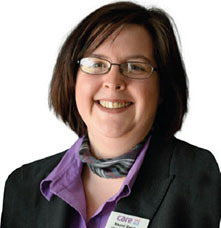 'I am senior registered nurse at Prince George House care home in Ipswich, one of ten new homes being developed by Care UK in Suffolk as part of a £60 million investment in the country’s residential care services. There are around 70 residents at the home. The youngest is a woman in her mid-forties living with dementia, and the oldest is 100. One of the best things about my job is that I get to spend time with the residents. I have 14 years’ experience in nursing and residential homes. As well as a solid skills base, the job requires a good ability to communicate; you have to understand the needs and wishes of people living with dementia, and be able to empathise with relatives as they experience their loved one’s journey, which can be very emotional. My role also involves managing the home’s nursing team, as well as managing and teaching our senior carers who play a vital role at the home – the more skills and knowledge they have, the more residents will benefit. My biggest challenge is time. I manage, nurse and teach, and try to ensure we treat every resident as an individual. Sometimes routines have to be followed, but we always try to accommodate residents’ individual needs and wishes.